After nearly 7 years, Ryan has officially joined the Harman family. Today my dad and Ryan ran the SLC Half Marathon. 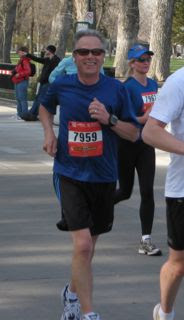 My dad showed restraint during most of the race, but at mile 13 (with .1 to go) his encouraging words ceased being helpful. Ryan, following in the footsteps of all three Harman girls and about a dozen kids on the PCHS XC team, told him to shut up. He did and they finished the .1 together, no hard feelings. Ryan does NOT consider himself a runner (more of a cyclist, really) but he showed great potential. Finished right at 2 hours. Way to go, babe, and welcome to the family. i knew i liked ryan. he really gets points with me on that one. dad needs to learn that the "encouragement" is only frustrating when your legs hurt, your lungs are done for and it is hot. Go Ryan! All that "not fun" preparation paid off. You were persistent I know, as I saw you leave and return from many of your "runs!" My hats off to you. Cant wait til tomorrow and BABY NEWS!! Way to go Ryan! I can't believe you could do that after being sick. I got the same bug you did and I can hardly take Chance for a walk! I am impressed and proud of you!! !